When I got married, I was a graduate student, finishing up my MFA in Creative Nonfiction. My then husband had a job change in the middle of my getting the degree, and his was the big job in our partnership, so we had to move to London, where it was hard for me to do much beyond work on my thesis—a book about the over-the-top madness of the new American wedding. I really, really wanted to publish that book before I had a baby. I was terrified that if I didn’t, my chance at a new career would disappear when motherhood came. (Before going to grad school I worked as a television news producer.) But of course I got pregnant before I even had an agent, much less a book deal. As we all know, however, pregnancy is long! I got an agent a few months before my son was born, and four days after he was born, I got my first book deal. It was the best feeling. It depends on what you mean by “all.” I think that’s where the conversation gets derailed before it even starts. In that formulation, “all” is defined by people who have a fundamentally unbalanced perspective on life: people who think that to have a career means you must put your career above everything, and therefore sacrifice being a good parent; versus people who think that to be a good parent you have to put your children above everything else, and therefore can’t have a career. How can we reframe the conversation? I try to start by rejecting the false workaholic versus stay-at-home mom dichotomy, but on a deeper, systemic level, workplaces have to change (I served on the Advisory Council for the Clayman Institute for Gender Research, and they are doing great work on this), and cultural norms regarding “perfect parenting” need to change, too. We also need a longer view. I don’t have it all every day. But if I look at a month, a year, or at the last ten years? I do. Right now I am really struggling with the pull of social media, because I am in that moment in the life of a writer where it is my job to be online all the time! It’s awful for the things I try hard to practice with my kids at home: focus, presence, and boundaries. But man, that endorphin rush every time you get a retweet…it’s a proven high. After having kids I had to learn that I couldn’t always find the big blocks of work time I used to have before them. I’ve gotten much better at stealing an hour and really getting something done. From your mother? My mother always said that if you have talents and abilities, you owe them to the world, not just to your immediate family. I love being a mom, but I know I have a duty to contribute to the wider world, too. From your kids? One night when I was putting my younger son to bed I said to him, “I love you so much, I’d never let anyone hurt you.” He propped himself up on one elbow, looked me right in the eye and said, “Mom, a lot of people have hurt me already. Like in school, where you can’t come.” Like, duh. We had a big laugh over that. I cannot be everywhere, or protect him from everything, nor should I try. With their growing competence and wisdom they help me to remember that. That everything was going to be okay. I would have done so many things differently if I’d really believed that. How to truly, every day, treat myself the way I would treat someone I love. Cleaning out that thing in the sink that catches all the food that comes off the dishes. It’s disgusting! Most New York apartments don’t have disposals. My god do I miss those from my suburban upbringing. Jennifer Egan’s. She writes compassionate, brilliant, practically perfect literary novels, and has risen above the level of the average-Jane author who has to spend an insane amount of time begging and pleading with people to pay attention to her work. (A status she’s earned through her prodigious talent.) And when I see her at pickup (we don’t really know each other, but our kids go to the same school in Brooklyn), she looks really happy. I can’t answer this. I just can’t. It’s like choosing your favorite child! I’m always reading more than one thing at a time, so forgive me! First The Opposite of Spoiled: Raising Kids Who Are Grounded, Generous and Smart About Money by Ron Lieber, which is transforming how I talk to my kids about money; Master of the Senate, book three out of four of The Years of Lyndon Johnson series by Robert A. Caro, because I love political histories; and Outline by Rachel Cusk, because I always have to have a novel in my life. Activity? What’s an activity vice? I’m sure I have one. Website? I sometimes completely go down the rabbit hole with those slideshows on sites like Celebrity Dirt: 16 Child Stars Who Grew Up To Be Hot! Top Fifteen Artists Who Are Older Than You Thought! I click on one, and then there’s another one, and I’m like a mouse hitting the lever for another pellet. It depends on whether my kids are at their dad’s house. When they are with me, I really try to get seven but sometimes it’s a little less. When they are with him, it’s closer to eight. The paper edition of The New York Times. I absolutely have to have it, I can’t read it online. My boyfriend is the same way—we have gone to great lengths to get it when we are traveling. 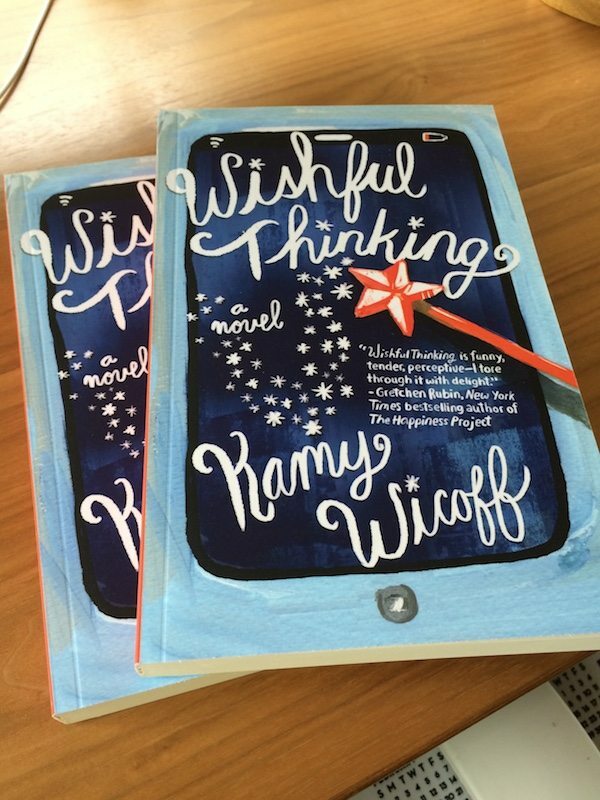 I wish I: were a better writer. I think any writer who really cares about what they do wishes that. My kids: are perfect. Seriously. They are. Nothing worth doing is easy. Nothing!!!!! Only that this was fun, and you ask great questions. 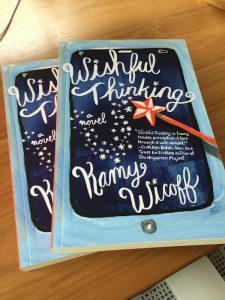 Kamy Wicoff is the bestselling author of the recently released novel Wishful Thinking, the nonfiction book I Do But I Don’t: Why The Way We Marry Matters, and founder of one of the world’s largest communities for women writers, shewrites.com. 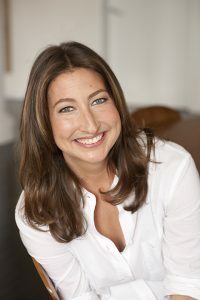 She is also founder, with Brooke Warner, of She Writes Press. She lives with her family in Brooklyn, New York.